Taking into account our favorite parts of spring, we challenged our designers to create stunning pieces that embodied the season. From the lightweight and colorful scarves featured in the Spring Forward section, to the trendy Cacti-inspired projects included in our Cactus Makes Perfect round up, you’ll find bright pieces for both your home and your wardrobe. 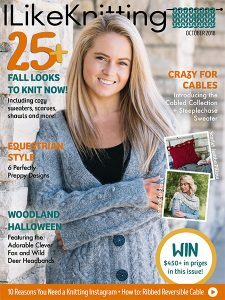 Get ready to fall in love with this new issue featuring some of winter’s finest patterns. 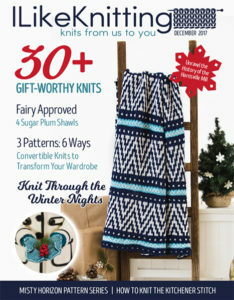 For the (chilly) romantics at heart, whip up some cozy projects featuring delicate heart details. We’re bringing you brand new winter classics to knit – but this time with a twist! 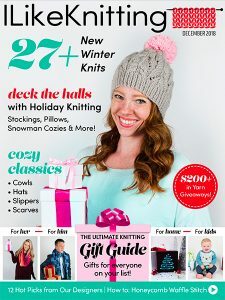 In an effort to ease the stress that comes with holiday gift giving, we’ve put together our own Ultimate Gift Guide featuring handmade projects for everyone on your list. Experience a fresh take on fall with patterns inspired by my favorite season. Whether it’s the sound of crunching leaves, the tingle of a cold apple hitting your taste buds or the vibrant shades the leaves turn during longer, cooler days ― inspiration is everywhere. 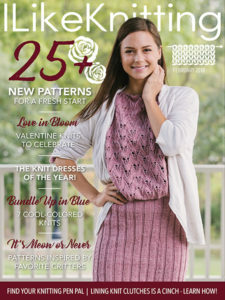 Get ready for a shift in seasons with this gorgeous issue featuring the perfect collection of summer-to-fall patterns. 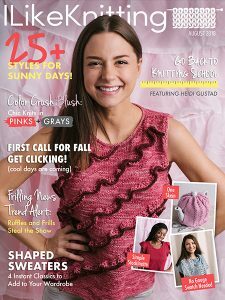 Beat the last of summer’s heat with frilly favorites, including the Dressed to Frill Top (on the cover) and the Frilled with Joy Peplum Tunic. Each piece adds some fun flair to your wardrobe. Did you hear that? Summer is calling your name! 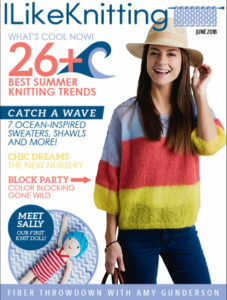 And we have just the knits to get you ready for warm weather, sandy beaches and more time spent with family and friends. Sun’s out, knits on! 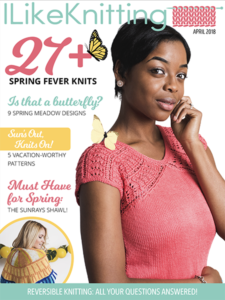 In this latest issue of I Like Knitting magazine, spring is in the air with butterfly-inspired designs. 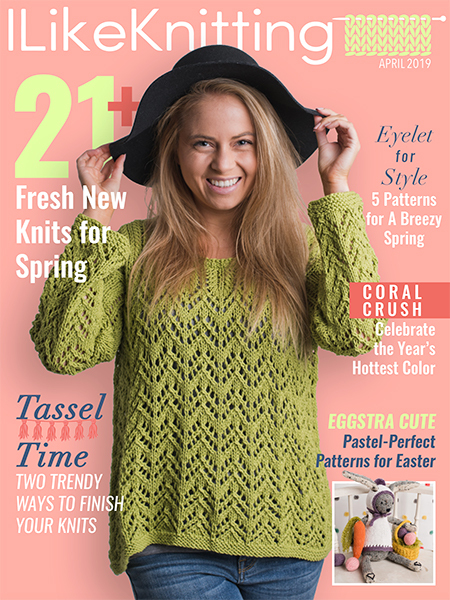 27+ patterns await in this beautiful new issue full of wearables and home decor. Make this year your knitting year with 25 new patterns for a fresh start! Love is blooming with our Valentine’s Day themed designs and we’ve got the blues for the Blue Frost patterns. 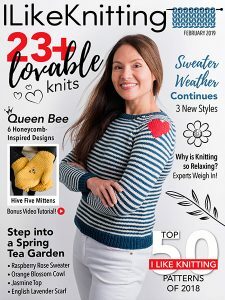 It’s meow or never…start knitting today! 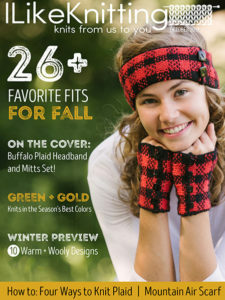 Inside this latest edition, you’ll discover a brand new selection of cozy patterns featuring wearables like the trendy Buffalo Plaid Headband and Mitts Set and the oh-so-comfy Alpine Cardi.